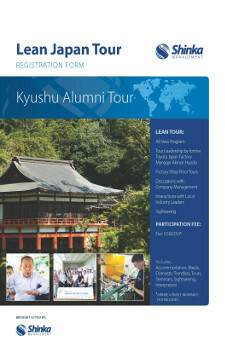 Return to Japan to experience an all-new program for Lean Japan Tour Alumni only. In September 2019, Shinka Management invite our past participants of the Lean Japan Tour to the beautiful southern island of Kyushu. A completely new selection of company visits has been arranged in the prefectures of Fukuoka and Oita. Also joining us for this special event will be Akinori Hyodo, the former manager of the Toyota HiAce plant. He will lead seminars and plant visit discussions throughout the week. The tour will be held on Sunday 22nd September through Saturday 28th September, and will include kaizen seminars and visits to factories for meetings with senior management. The tour coincides with the Rugby World Cup. A great opportunity to also take in the atmosphere of the event’s host country. The September 2019 tour is open to all past participants of the Lean Japan Tour.